If you read my preview then you know I was pretty excited to finally be returning to this classic road race for the 20th time but my 1st since 2002. Like so many things there have been a lot of changes but the great course, the volunteers and race organization are still among the best in the country. My main goal in this was to have some fun on the challenging course and see how fast I could run in comparison to my previous races here. And I was hoping if things went well I might even make the podium, something I would never have imagined would be in a race this large and with such a competitive history. Race morning was a bit more humid, about 80% and warm in the mid 60's than I had hoped this late in the month but I still felt I was ready. I did my usual warmup routine on the adjacent E.C. Glass High School track and made my way over to the start with 1400 other 10 milers and about the same number in the 4 mile event. I was surprised to see Raleigh friend Laura Berry and Nick Meeker in front of me so I wished her luck in this her first time racing here. She would win her age group ! As the race began I just tryied to relax. No point in pushing things here, just letting gravity help get me settled in. After a short little hill at qtr mile the next 1.25 are all downhill and most of that is pretty steep. You can get a little cushion but have to be careful and not pound the life out of your legs this early ! I was hoping for around a 7:30 first mile and nailed it in 7:27. All well and good but how would the 2nd mile be when the first big uphill comes? I continued on at a relaxed pace to the bottom of Farm Basket Hill as it is called and at 1.5 it was time to start the half mile steep climb up to mile 2. I was feeling pretty strong and hoping for a good split and finally topped out in 8:04. This was great ! Maybe my fantasy of sub 80:00 was a possibility ! Mile three is gently rolling but mostly uphill and I maintained pace just a little over 8. By now I was feeling really good and and settled into a nice groove and confident it was going to be a good day. Mile 4 has one short but steep hill and then a nice gradual downhill. Just before approaching the point where the races split I was passing one of the 4 mile racers . He was making the death sounds like I make near the end of some of my hard races when I am giving it all I've got in the last mile. I had to smile and was thinking yep, thats probably going to be me at mile 9 ! But right now I was on cloud 9 and with a 7:45 mile 4 I added a little to my cushion. And I knew I would need it in the next mile. Just about the 4.5 mark the course makes a loop through Riverside park. A slight uphill and then down down down. But the climb back up is brutal. For those of you familiar with North Turkey Creek in Umstead, the 5 mile mark is right in the middle of a climb like the steepest on on that trail. Up on your toes for the first 100yards and then not nearly as steep for another qtr mile after you pass that mark. I was happy to feel strong going up. Those training runs in Umstead in the weeks before paid off ! 8:01 ! The next 3 miles as we were heading back were mostly uneventful. I was staying pretty steady but losing a few seconds of my cushion each mile hitting between 8:05 and 8:10. About the 7.5 mile point a man that looked like he could be in my age group passed me so I tried to hang on just behind him. 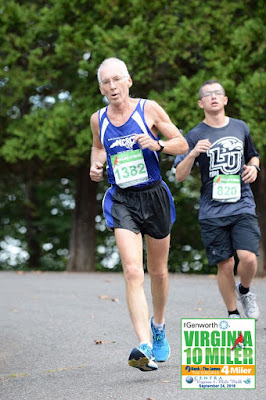 Right at the 2 mile point we both passed another grey hair but he was slowing. We started down the steep half mile downhill to the bottom and I was trying to maintain contact but not beat my quads up too bad. 19 previous times have taught me to save a little for that last long climb. We hit the bottom just a few strides apart. Now it would be who had the strength for the climb. Well, it wasn't me. I just didn't have too much left and could only watch as he gradually pulled away. NowIi just had to settle in and try to finish as strong as possible. The sub 8 dream was truly just a fantasy today. To give you an idea about the last 1.5 miles, imagine running powerline in Umstead 3 times ! Slowly I trudged on but had to take about a 30 second walk break to get my heart rate under control and find a pace I could hold the remainder of the climb. Despite that mile 9 was still a 9:16. It was such a beautiful sight when I came over the final bit of the hill and the slight curve and the finish line came into view. Just a couple of hundred yards of pain to go. I passed a 20 something man bent over throwing up and I thought that I could have advised him not to drink the gatorade when you have a tough 1.5 mile clmb ahead of you ! It seemed to take forever but I finally finished in 83:07. Slightly disappointd for a few seconds but that quickly turned into a big smile ! That time was faster than any of the races in my 4 year streak from 1999 through 2002 ! The miracle year of beating my younger self continues ! After getting some food and drink I found a printout of my results and was amazed and delighted to be 2nd in my age group out of 37 ! But I'm afraid the next day after making time corrections I was moved back to 4th so I just did miss making that podium ! This is a wonderful race that will always be very special to me and I would recommned to anyone looking for a great experience on a challenging course. I'm sure i will be back but not going to make a comittment as to when right now. Joey, The News is A Great Encouragement To Me This Morning. 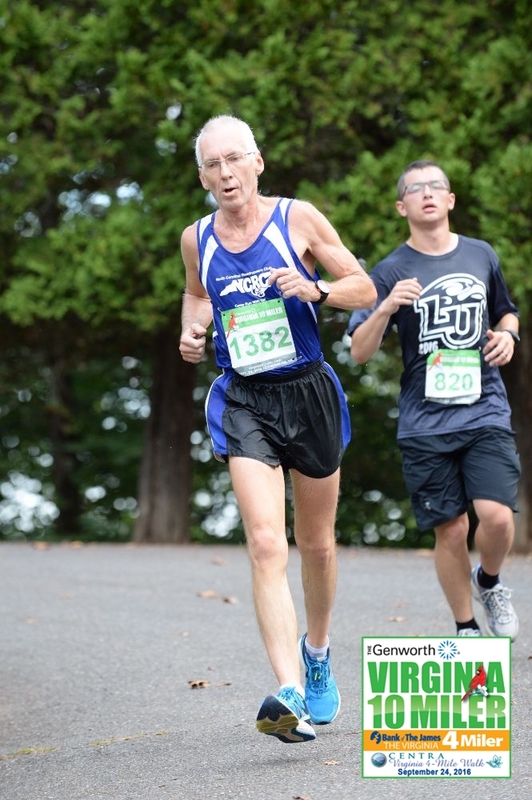 Glad You Are Enjoying Your Favorite Pastime Of Running. Keep Up With Posting Your Reports Here As I Find Them Enjoyable To REad.